(Trent Nelson | The Salt Lake Tribune) The Rev. 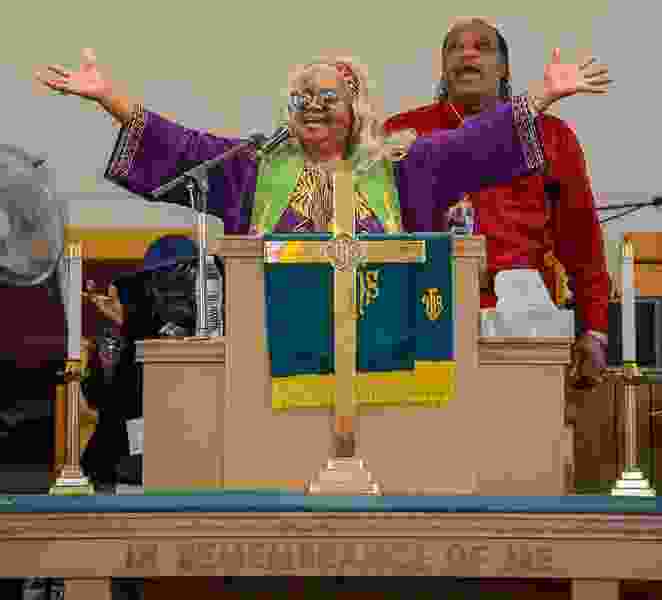 Nurjhan Govan is retiring after 14 years, the longest-serving pastor Salt Lake City's historic Trinity AME Church has ever had, Sunday, Aug. 19, 2018. At rear is Associate Pastor Daniel Stallings. The share of women in the ranks of American clergy has doubled — and sometimes tripled — in some denominations during the past two decades, a new report shows. Campbell-Reed and a research assistant gathered clergywomen statistics that had not been collected across 15 denominations for two decades. The Rev. Barbara Brown Zikmund, who co-wrote the 1998 book “Clergy Women: An Uphill Calling,” welcomed the new report as a way to start closing the gap in the research. Reached between recent convocation events at Andover Newton Seminary, the Rev. Davida Foy Crabtree, a retired UCC minister, said the report’s findings were reflected around her. But Campbell-Reed also found that clergywomen — with the exception of Unitarian Universalists — continue to lag behind clergymen in leading their churches. In the UCC, for example, female and male clergy are equal in number, but 38 percent of UCC pastors are women. Instead, many clergywomen — as well as clergymen — serve in ministerial roles other than that of pastor, including chaplains, nonprofit staffers and professors. Patricia Mei Yin Chang, another co-author of “Clergy Women: An Uphill Calling,” said the new statistics prompt questions about the meaning behind them, such as changing attitudes of congregations or decreases in male clergy. Campbell-Reed, whose 20-page report concludes with two pages of questions for seminaries, churches, researchers and theologians, said the answers about the often-difficult job hunt for clergywomen relate to sexism. Some women are reaching “tall-steeple” pulpits — leadership in prominent churches — instead of being relegated to struggling congregations, often in denominations on the decline. Frederick-Gray said her denomination, which is working on race equality as well as gender equality, is seeing greater opportunities for women to preach in its largest churches. Of the 41 largest congregations in the Unitarian Universalist Association, 20 are served by women senior ministers. Women’s leadership, Frederick-Gray said, is necessary at a time of decline for many religions.